﻿The musical rest is defined as being a pause during which no sound is heard until the next tone is sounded. And the same goes for a musician who makes a long pause, which is then ended by thundering applause from an enraptured audience. This is exactly what happened on 9 May 1965, the day on which Vladimir Horowitz stepped onto the stage at Carnegie Hall after an absence of 12 years. As so often, the maestro ignored all types of works from Viennese Classicism, and certainly no one missed them. Busoni’s arrangement of Bach’s Toccata in C major, BWV 564 is precise, has enormous presence and is yet impressively transparent; Schumann’s Fantasy op. 17 is emotional, at times breathless and charming; Horowitz captures the spirit of Scriabin and Chopin with virtuosity and heartfelt emotion, allowing the works to waft over the audience. 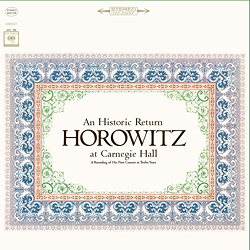 As a finale to this celebrated comeback, Horowitz performs a delightfully light and fresh rendering of Moszkowski’s Etude in A major, op. 27, and brings the evening to a peaceful end with Schumann’s unique "Träumerei" ("Dreaming") from Kinderszenen ("Scenes from Childhood"). In this live recording of just one of several comebacks, the discerning listener will notice the tension and nervousness at this literally high-temperature event – the noisy air-conditioning had been shut at the request of the recording engineers.